Rajasthani Churma Recipe – When we serve dal bati, a side of this is the best accompaniment. Hence it is called dal bati churma. While making the bati, I have made few extra to make churma. Yes, batis are crushed and mixed with sugar, ghee and nuts. It is that simple. There are few variation to making it. My mother-in-law makes it by frying the dough dumplings. Sometimes she makes ladoo out of it. While this one is made from whole wheat bati which are baked in oven. 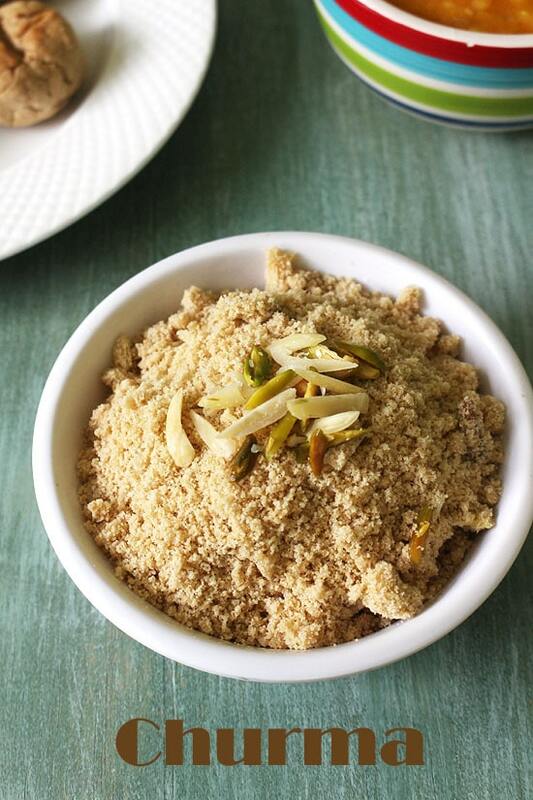 This Rajasthani churma is semi-sweet dish. Meaning it is not sweet like dessert. That’s why it pairs perfectly with lightly spiced dal bati. You can enjoy this as is in original form (coarse powder form). Or you can go step further and make ladoos. In that case, you need to add more ghee and sugar. 1) To blanch the almonds and pistachios, soak them in enough hot water for 15-20 minutes. 2) After that discard the water and peel the skin off. Now slice them using sharp knife. 3) Now make bati by following this step by step method. 4) Break them using your hand and add into the grinder jar. 5) Grind into coarse powder. 6) Remove it to a bowl. 7) Now add melted warm ghee. 8) Mix well till everything is incorporated well. If it looks dry then you can add more ghee. 9) Now add sugar, cardamom powder and nuts. 10) Mix well and it is ready to serve. Serving suggestion: This rajasthani churma is served on side with dal bati. Or you can enjoy it as a dessert too. Soak the almonds and pistachios in hot water for 15-20 minutes. Then peel the skin and slice them. Grind the bati coarsely into the grinder and remove it to a bowl. Add melted warm ghee and mix till everything is incorporated well. Then add sugar, sliced nuts and cardamom powder and mix. Remove it to a serving bowl, garnish with more nuts and serve. Very nice article, i must say. Nice step by step procedure, which make easy for us to cook it. I tried it once and was damn tasty!! Glad to know you liked.